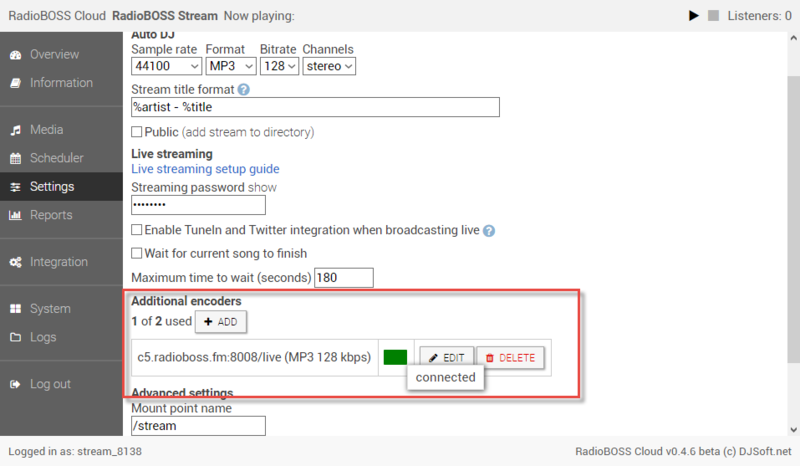 Additional encoders allow you to send a stream from RadioBOSS Cloud to other streaming servers or to add new mount points on the RadioBOSS Cloud server, e.g. to broadcast in a different format or at a different bitrate. 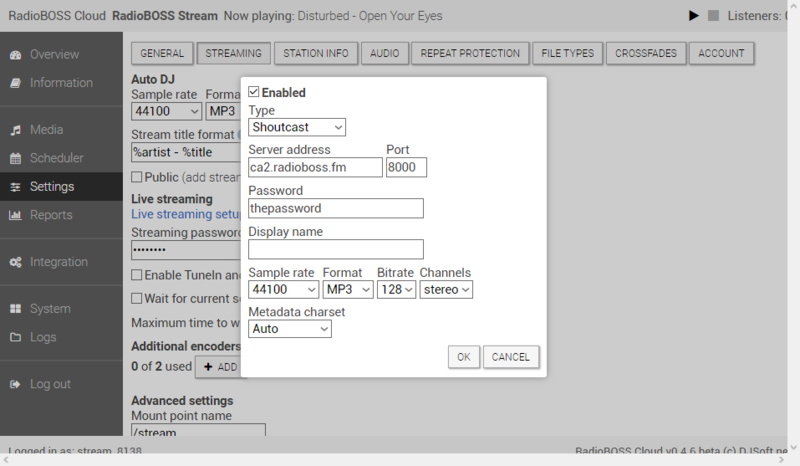 When broadcasting to an external server, Icecast and Shoutcast servers are supported. 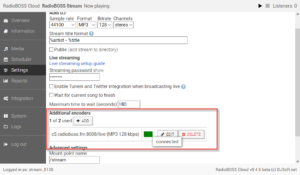 The feature can also be used to migrate from other streaming services to RadioBOSS Cloud: configure an encoder to broadcast to your old server, so the old stream links will still be working. 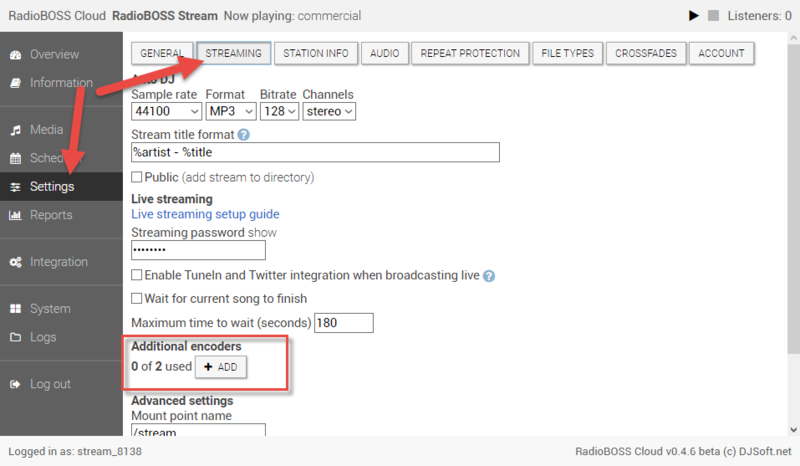 To use the feature, click “Settings” in the menu and navigate to the Streaming section. Click the “Add” button to add a new encoder. A window will appear where the encoder can be configured. To add a new mount point on the RadioBOSS Cloud server, choose the “Internal server” type and enter the mount point name. The tune-in links for the newly created mount point will be available in the “Information” section. 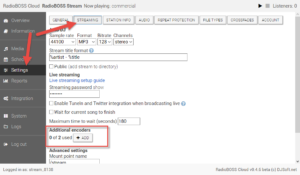 To stream to an external server, choose either Shoutcast, Shoutcast v2, or Icecast, then enter the server connection details: server address, port, etc. as given by the service provider. The Display name sets the name to show the encoder in the list. The field can be left blank. Sample rate, format, bitrate, channels set the broadcasting format. Metadata charset – in most cases should be left at Auto unless the server requires specific configuration. After a new encoder is added, it will be shown in the list. The status box indicates the encoder status. Green color – the encoder is connected. Yellow – the connection is in progress. Red – there’s an error, hover the mouse over the box to see the details. In case of an error, you should also examine the log (click “Log” in the menu).